Are you as busy as I am sewing and creating a ton of holiday gifts? I put too many hand-made items on my Christmas gift giving list this year, but I am willing to add one more in order to be a part of our gift exchange at the December meeting. There is a $10 limit on gifts that you bring. You can make something; a pincushion, pillow cover, mug rug, etc. Or you can buy something; replacement rotary blades, fat quarters of fabrics, a book of modern quilts, or whatever you think a fellow modern quilter could use in their sewing room. 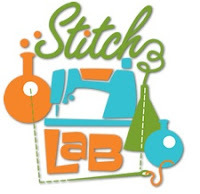 Have fun, be creative and bring your wrapped gift to Stitch Lab on December 8th, our meeting will start at 6:30 as usual. We will assign a number to each gift and draw numbers from a hat to determine which gift you get to take home! There will also be a giveaway; again, a winner will be chosen by drawing a number. The book is Pretty in Patchwork Doll Quilts by Cathy Gaubert. Our AMQG November Meeting Topic will be "Stuff" -- meaning all the awesome tools, books, and other quilting items we love, beyond the fabric itself. Bring your coolest tools to show-- the best books, your most indispensable ruler, your favorite fusible web, etc. In addition to sharing the "best" of our tools, feel free to bring tales of tools gone wrong, tools that either were not worth the money or completely derailed a project. Also, I imagine many of us will have some souvenirs from the Houston International Quilt Festival--feel free to bring those as well.